10 Cute New Traditions To Make Your Shaadi Even *More* Special! Weddings are filled with traditions - some of them are as old as time and others are superstitions that have come about and made their way into weddings over the years. Here are some ideas that you can incorporate into your big day together - after all, you are starting a new life together so why not start some new traditions of your own too?! Write a note to one another before the ceremony. Get a younger relative to act as messenger! You can follow this tradition on every wedding anniversary! POPxo Tip: Keep the letters and bind them together to make your own love story book! Go through it every now and then, in the years to come. Get the guests to write notes and messages for the couple and stick them in a cute trinket box! POPxo Tip: Keep this box safely and open it after 10 years together to relive the memories of your special day! 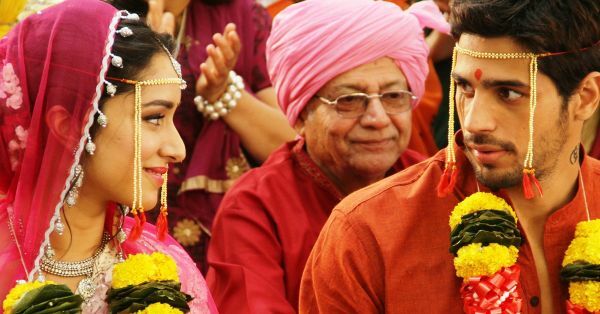 Also read: 11 Adorable Western Wedding Traditions For *Your* Shaadi! If you still have the clothes from your first date - you can get them made into a dupatta for your ceremony - the one that is used to bind you both together for the pheras! POPxo Tip: Get a tailor to stitch patches of this fabric together for an awesome effect! Keep this with you forever. You could even frame this. What better time to tell your beloved how you truly feel about them? POPxo Tip: Use moments and memories that are personal and special to you as a couple. You could redo your vows and come up with some new ones every anniversary, perhaps. These are candles that are traditionally lit by the mothers of the groom and bride and then passed on to the newlywed couple to light a bigger candle - unifying the families. POPxo Tip: This is a tradition commonly followed in the far East! Have a look at traditions from all over the world and see if there is something that strikes your eye! And why not do the same at your children’s wedding? If you have a memento from earlier in your relationship - why not send it across to the groom/ bridal party chamber. This reminder of your love for one another will be sure to calm down any cold feet and help you to remember the special bond that the two of you share! POPxo Tip: Attach a note telling your fiance that you love him/ her and can't wait to spend forever together! To continue this adorable tradition, give him a memento every anniversary - this could be something small from your past year together, even tickets of a cute movie you watched together. Just the fact that you saved it will definitely touch his heart. Also read: Shaadi Planning? A Checklist Of 11 Things Kinda Easy To Forget! Just like a love letter, you can each choose to get one another something that can be engraved with the wedding date and be kept forever! POPxo Tip: Get him a watch with a personal inscription on the back! This one will be with him forever and be a reminder of your love that he will have on, every day. Do something together the night before the wedding that signifies your last moments together before becoming husband and wife! POPxo Tip: This can be a long walk together or even a simple dinner! It will be something you remember and treasure for years to come! Celebrate your wedding anniversary eve in the same way every year. Instead of leaving the venue earlier than the rest of the people at your wedding, use the reception night to dance the night away! POPxo Tip: Get some sleep in the day before the reception and have shuttles come and collect guests after they bid their goodbyes and good wishes! It will be just you two on the dance floor in the end! Don't forget to play your special song on every anniversary and dance to it like you did on your wedding day.